Reviewing Mozy again after almost a decade is like coming home. After all, it was the online backup service the pretty much got the ball rolling with 2GB of free storage—back when 2GB covered most people's needs. Times have changed and data sets have ballooned, but with Dell EMC behind it, Mozy is still one of the most confidence-inspiring online backup services available. Check out its competition in our comprehensive online backup roundup. Probably the nicest thing about Mozy is that it both backs up and provides the sync folder functionality that you get with Google, OneDrive, Dropbox, and the like. It's not as versatile overall as iDrive, but it does cover the two most important roles. Clients are provided for Windows, OS X, and Linux (Pro only), as well as Android and iOS. Mozy provides sync as well as backup. Mozy keeps up with the times by allowing you to back up the same data set to a local hard drive. Local backups restore far more quickly (in most cases) and give you the duplicate backup that should be part of any coherent backup strategy. Mozy retains file versions for 90 days and offers up to 448-bit Blowfish security. That's probably massive overkill for most users, but it's nice to know it's available. Mozy Backup does a good job of automatically corralling the the files you'll want to back up—pretty much everything in the user folders, such as My Documents. Beyond that, you're on your own. However, if you are storing stuff elsewhere, you should know its whereabouts. 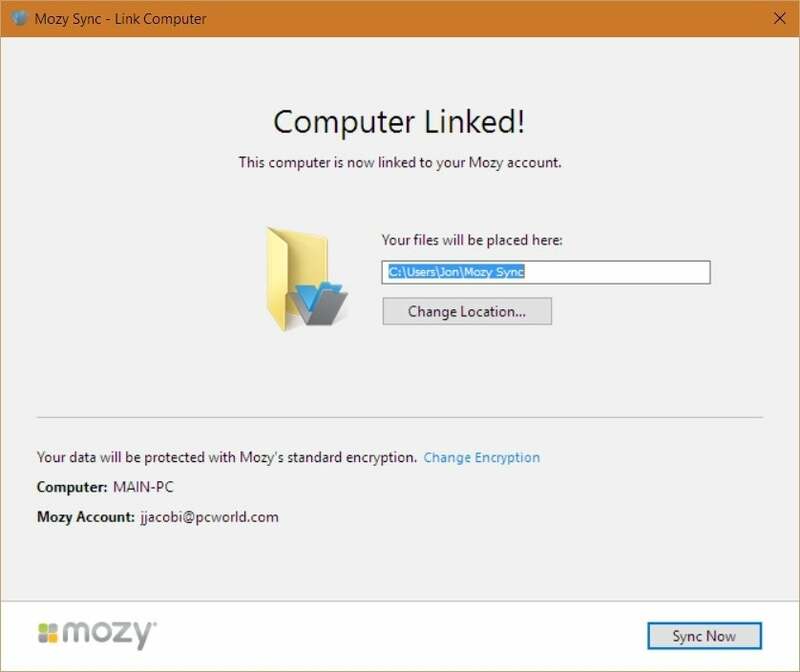 Mozy Backup and Mozy Sync are downloaded and installed separately, and while both are easy to use, they could integrate better with the operating system—and each other. For instance, there's no quick access icon for the sync location, as you'll get with DropBox and the like. And if you right-click on Mozy's Sync folder (Users/"Username"/Mozy Sync) you're actually afforded the option to include it in the Mozy Backup. Unnecessary redundancy certainly isn't a fatal flaw, simply indicative of how the two services could be meshed better. 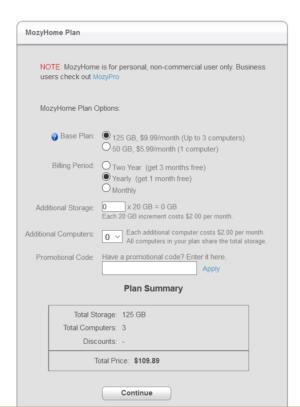 Mozy Home is free for 2GB. Don't scoff: That's probably enough to back up your most important documents. 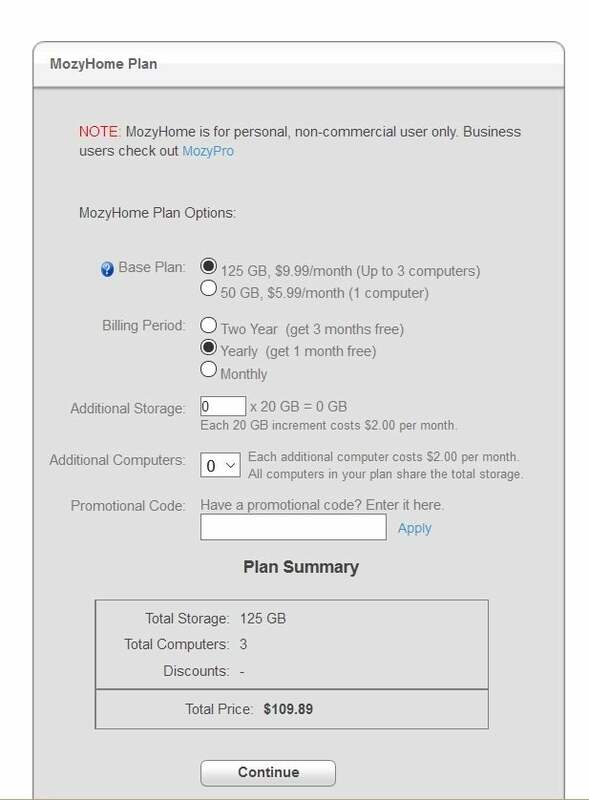 Beyond that, you'll pay $6 a month for 50GB of storage, while the best deal for most users is likely the 125GB plan for three computers at $10 a month. Backblaze it isn't, but Mozy is competitive cost-wise if your data set is relatively tame. You can purchase or upgrade Mozy using the local client. 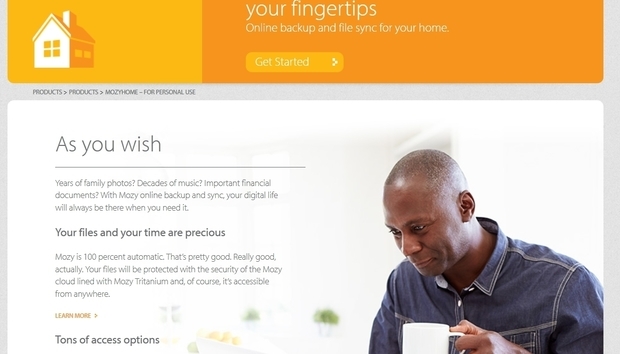 Mozy is a venerable and highly reliable and secure online backup service that worked quite well in our hands-on. Getting both backup and sync in one package is nice, and shows that the company understands the target audience. But better client software, at least on the Windows end, is in order if it wants to keep up with the competition.